We’re heading into birthday season in my family, and it’s always a long run. Everyone’s birthday falls between March and August, and since we all live in the same area, it’s a lot of parties and cake. Can you guess who bakes a lot of the cake? Yep. I’m cool with it. This year, my son has requested his usual vanilla cake with…ready? RAINBOW frosting. As in, all different colors. If I didn’t love the kid so much, I would have told him in no uncertain terms that I’m not in the mood to spend the next three weeks studying YouTube tutorials on how to get a rainbow cake accomplished with the least amount of pain. At the moment, the main decision lies between fondant and buttercream, but that’s just the tip of the iceberg. And don’t get me started on goody bags. Just do not. I guess all of these issues are as widespread as the age-old question of what to eat for dinner. Check out my post on the Today Food Club website and click to the left of the Facebook icon to vote for me! If all of life’s problems could be solved as magically as a, well, magic bar, I’d be a happy kid. These are so simple to make, and they hit all my happy places! Hey, if only party planning could be as easy as a magic bar. But we can only have so much in life! 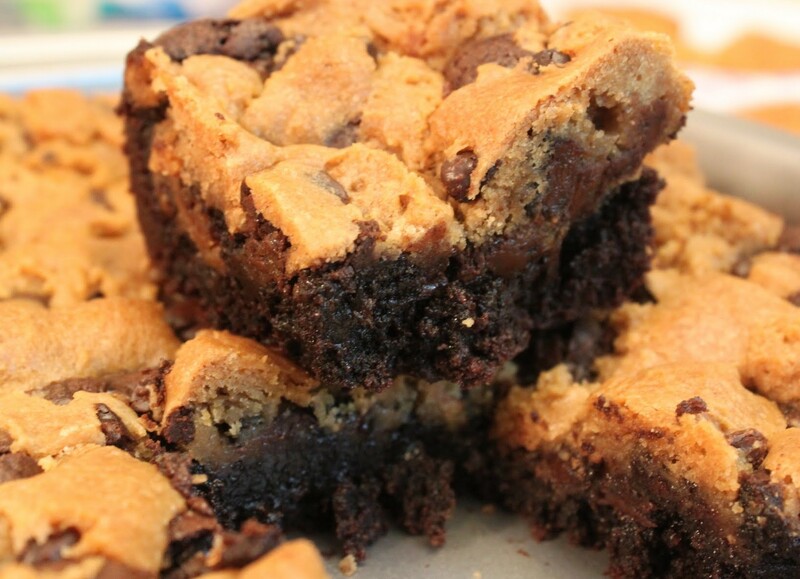 In a world with peanut butter s’more magic bars, it’s not right to complain anyway! Preheat the oven to 350. Line a 9 x 13 pan with foil, letting the foil hang over the sides. Coat with cooking spray. Set aside. In a microwave-safe bowl, melt the butter and peanut butter chips for one minute. Stir until smooth. Add the graham cracker crumbs, mixing until the crumbs are moistened. Press the crust into the prepared pan with a rubber spatula or your hand, ensuring that everything is packed in evenly. Bake for 10 minutes. Remove the crust from the oven. 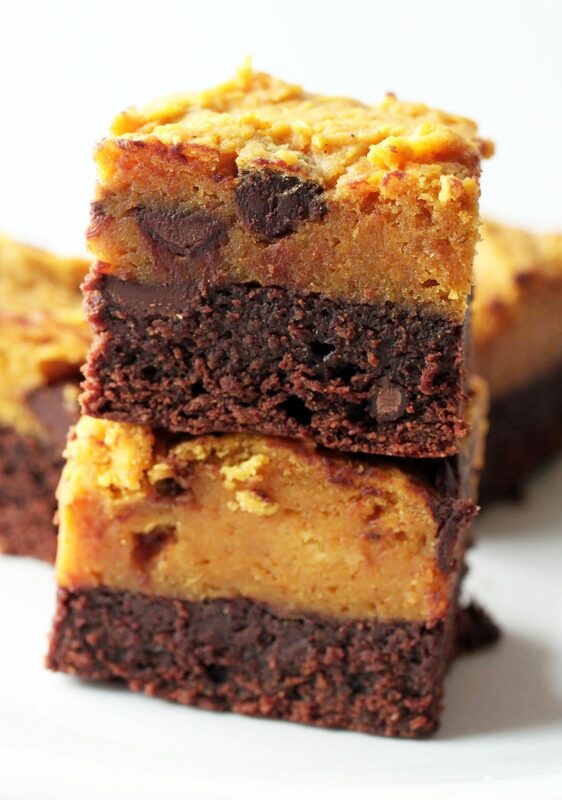 Evenly sprinkle the milk chocolate chips, peanut butter chips and marshmallows over the crust. Pour the sweetened condensed milk evenly over the top. Bake for 25 minutes. Cool completely and cut into squares. 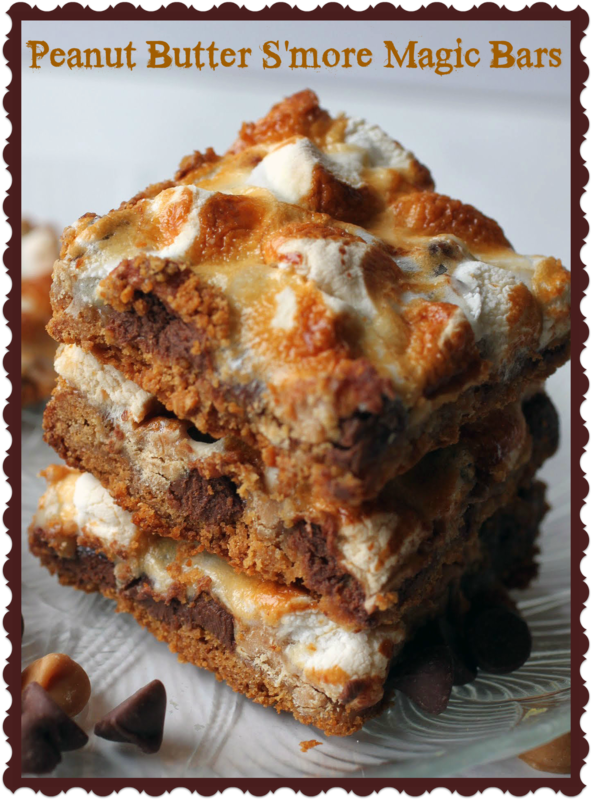 It is great guys that your b-days are in the warmer months, I envy you 🙂 Need to try the pb s’mores combination, these look amazing! Thanks, Mira! I love PB s’mores. So much better than regular ones! It sounds like you have lots of cake filled birthday parties coming up. Not that I am at all jealous! Haha, love the Kayne reference too. It’s actually a little too much, Dannii. Birthday cake gets old when you’re eating it every week! If only all of our problems could be solved by these bars! What a delicious treat, Mir! I’ve never actually had magic bars before (crazy, right?) so I’ve definitely got to try this smore version. Love your video, too! That IS crazy, Gayle. You can make them in so many flavors, too. Try it sometime! If this was the last thing added to the world I’d call it a victory. Let the zombies take over now! ha! It would be a victory. Except no zombies. Terrifying. Haha. That Kanye line cracks me up. But seriously, whenever peanut butter and s’mores get together I think the clouds break and sun shines down on the world. I want one of these right now! You are so right, Amanda. S’mores and sunshine! I’ve not tried baking with marshmallows for a very long time, time to buy a packet to make these! They look so wonderful and so perfect for parties! They are great for parties. I’m bringing these to a meeting today! Seriously. 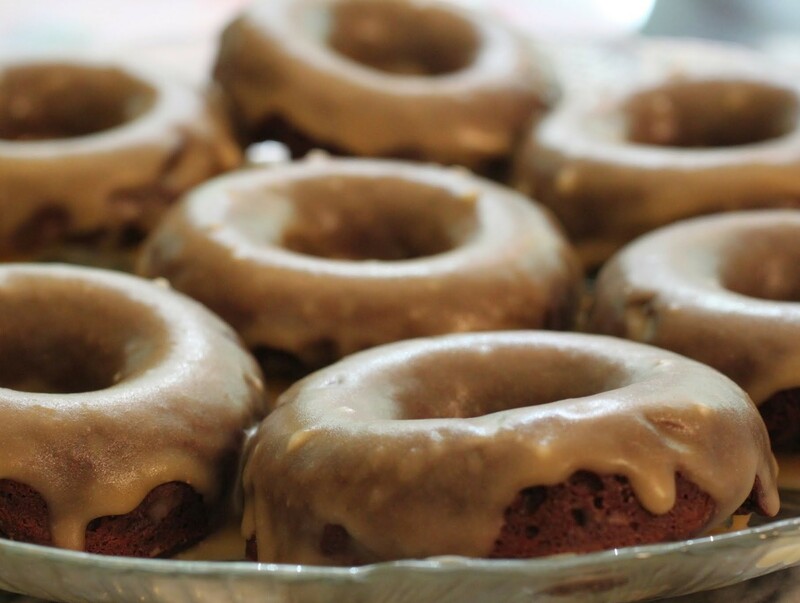 I mean, rainbow frosting is pretty and all, but…PEANUT BUTTER. I am sure you will do a great job with the cake Mir! I say go with buttercream, I am not a fondant fan but that’s just me 🙂 Love these bars, smores with PB sounds just better! Yeah, fondant isn’t as tasty as frosting. But piping on all that rainbow bling…aaaaaaah. I really hate how birthdays bunch. It makes it so stressful and busy and you can’t just appreciate one of them! LOVE these, obvi. The best! Exactly. All of us are teachers in my family, so we all timed our babies for spring or summer. It’s our fault! These look unreal! Magic bars are one of my favorite desserts because they have so much going on, but you just went and took ’em to the next level with the PB and s’mores flavors 🙂 Love it! Had to take them to the next level, Medha. Otherwise, no point! Hahahahaha! I am still laughing over here at your “s’mores need peanut butter like Kanye needs Twitter” comment. Thanks for that, Mir. 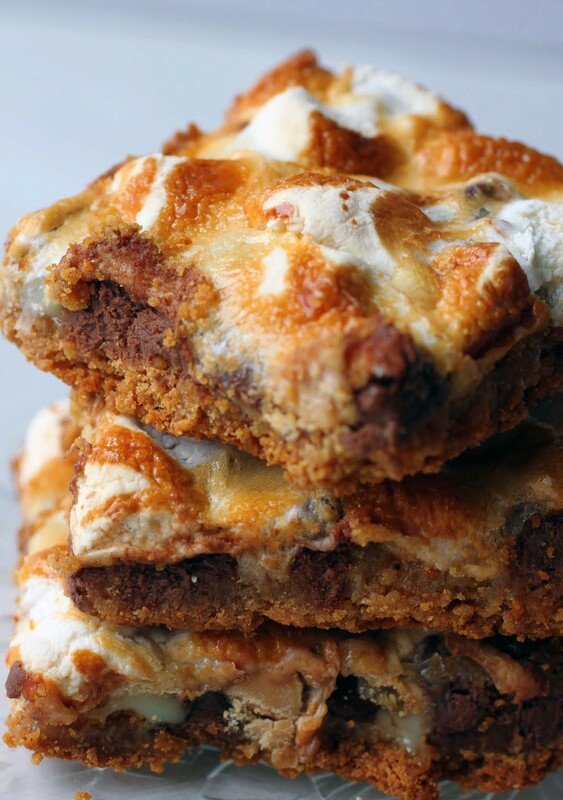 😉 Sounds like you will be busy in the kitchen busting out cakes for the next couple months, but I think maybe you should just tell everyone they are getting these PB & Smore Magic Bars and call it a day. I mean who WOULDN’T be happy with these?! They look delicious, girlfriend! Magically delicious indeed! Pinned! Cheers, dear! I will be busy in cake land…but that can be fun! I’m not sure if it’s possible to pick on Kanye. He’s an untouchable force, Kim! Oh Mir, you had me spewing coffee through my nostrils when I read “s’mores need peanut butter like Kanye needs Twitter” Haha! Thanks for that! I wish I had your confidence in my decorating prowess, Shashi! But thanks. I’ll try my best! He probably doesn’t need Twitter, but Twitter needs him. Or something like that? Thanks, David! Is it bad that I’ve never tried magic bars before? 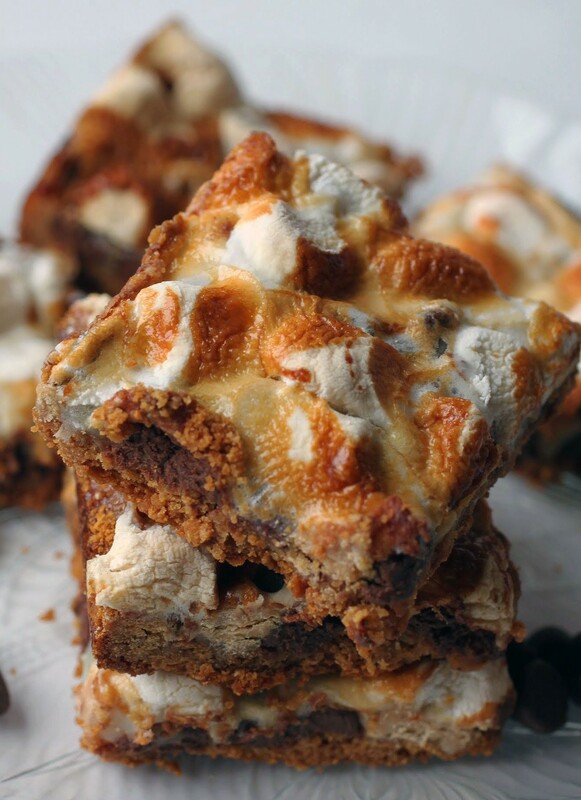 I feel like it is, especially after seeing these delicious s’mores magic bars! These are such a fun idea, Mir.